Librarians! Who’s Ready For A Game Of Library Bingo? 14 Responses to Librarians! 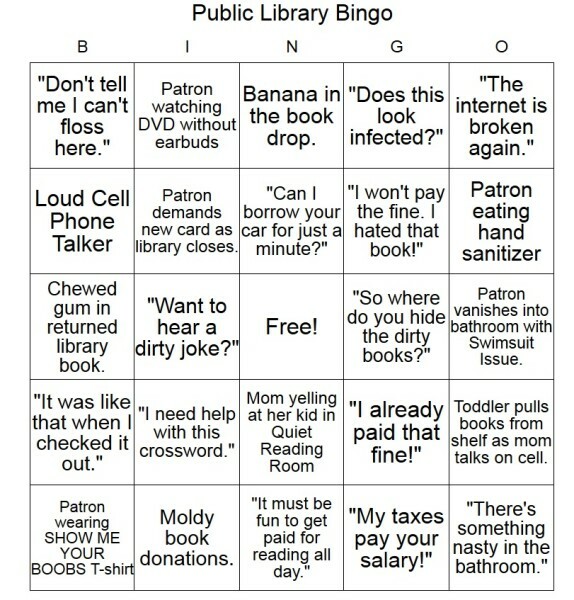 Who’s Ready For A Game Of Library Bingo? I can only imagine, great post. Both great articles. I immediately forwarded the college essay article to a friend who is in the business of helpling students w/their essays. I know she will love it. Librarian article is another hoot! Fantastic! May I print it for the librarians in my life? Could you help me work the automatic book checker out thingy? Of course! I’ll be right there. On really bad days, I guess you play full-coverage Bingo. Maybe you could also develop a drinking game? Thank you for writing the Philly Inquirer article on cheating and on the proper way to help a student with writing. That’s a much-needed, important article, and I applaud you for it. There is a library job as bingo drinking game somewhere on the Net.